"I really hope they work extremely hard on the OL." I really hope the OL heals completely, and returns to pre-LSU form. Thanks, coach. Excellent as always. Well coach this is as good as it gets. I have to say my knees are sore from staying on them so much during the game. RTR! Dead on again, Coach! Thanks. We played, by far, our worst game of the year and still won. That speaks volumes about this team. We played like the tired team that we were. We now have a month to heal and rest, and I sure like our chances against Ok. I think everybody thought that Tua was trying too hard to make the big play. There should be plenty of opportunity for that against Ok's porous defense, however, Tua needs to take what their D gives him. Should be plenty of opportunities for big plays. By the way I forgot to thank Kirby for one, the fake punt and two putting Fields in on some plays when Fromm was having a great day. I'm glad you mentioned that. I haven't seen a thing from Justin Fields this year that has impressed me. Ga better hope nothing happens to Jake Fromm. 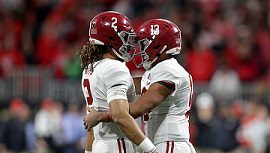 Fields and Jalen Hurts may go start their own team somewhere else. Thanks again coach. Great analysis! I am really, really glad my doc has me on good blood pressure and cholesterol medication else I'd have had multiple heart attacks and strokes last night. Sure glad to see Jalen get his chance and take advantage of it. I bet the Oklahoma coaches are wondering who will play QB for us in Miami. How hard is it to prepare for 2 different QBs? ROLL TIDE!!! It is pretty difficult. However, what is a help is how Jalen looks to throw instead of just run after his first read isn't there. Absolutely! Last year you could see trepidation in Jalen's eyes at the line of scrimmage. You see nothing but confidence now. He is a totally different player and person than he was last year. BUT... Jalen still failed to step up in the pocket when looking downfield. Instead, as last year, he backed out and rolled right when the first option wasn't there. It worked, but I was very surprised that UGA didn't adjust. It worked both times, to perfection.